1. Sort the word cards by genre (prose, poetry, and drama). Use the sorted cards to label and fill out a Venn diagram. Use the color-coded activity cards and organizers for beginners, and use the blue activity cards and black organizers for advanced. Includes cards for Drama, Poetry, and Prose. 2. Choose a poem, a play, and a story. 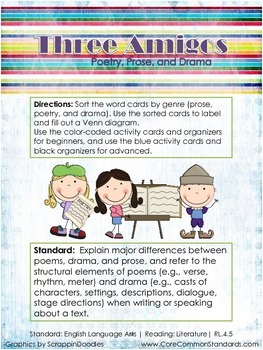 Fill in the provided literary elements cards with details from the literary pieces that seem the most fitting. Then cut them out and sort them into piles, depending on what kind of writing they describe best. 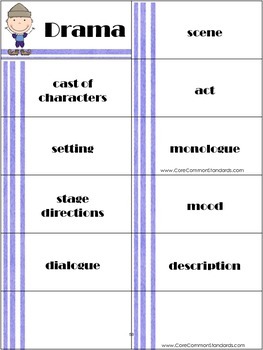 Make sure to use quotes and details from the writing as you fill in the cards. RL.4.5. 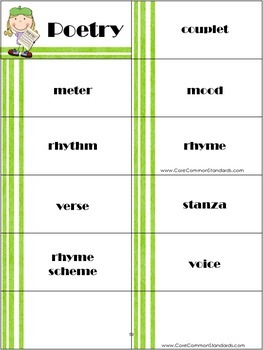 Explain major differences between poems, drama, and prose, and refer to the structural elements of poems (e.g., verse, rhythm, meter) and drama (e.g., casts of characters, settings, descriptions, dialogue, stage directions) when writing or speaking about a text.